Balsa base for the station throat complex, with two ferrite magnets embedded in it. 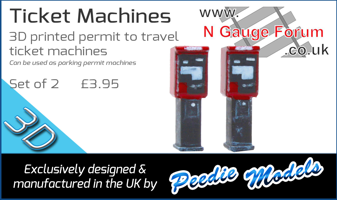 These are my latest attempt to get MicroTrains knuckle couplers to work reliably. They seem OK so far, but if they don't do the job I should be able to pry them out sideways without lifting the track. Using the delayed uncoupling facility I should be able to shunt the whole layout with only two uncouplers - this one at the station entrance, and one at the other end for loco release. Main pointwork complex in place. Operating mechanisms still need to be done, but wagons seem to roll happily through all the roads without derailing, which is a good start. At the baseboard join I have glued down a strip of PCB and soldered the rail ends to it for strength. This will be disguised with a barrow crossing in the usual fashion. Not bad, considering that on Friday lunchtime the board was sitting on the shelf in a DIY store, and I was out most of Saturday. I still need to lay the other fiddle yard road (and find a better way of applying Evostik to flexible track bases) but most of the tricky stuff is now done. 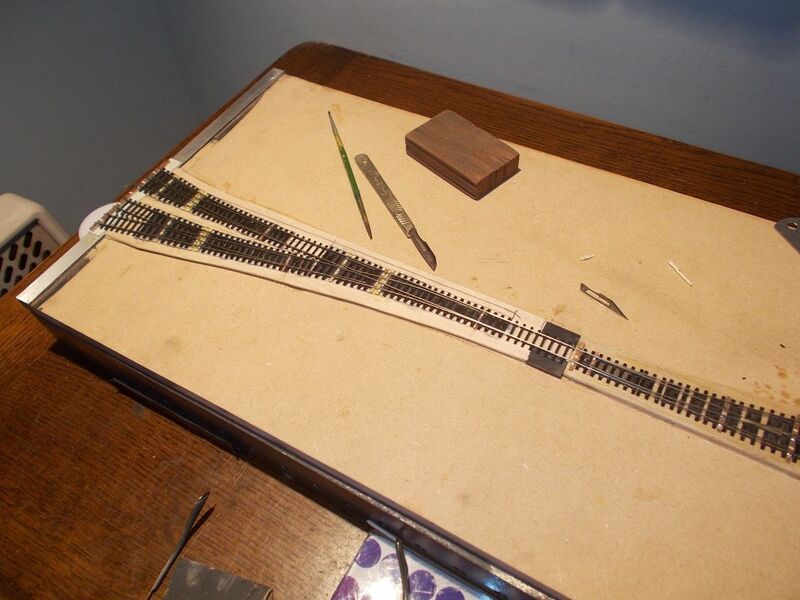 The other board only has one turnout and some lengths of plain track, mostly straight. I can't decide whether to join the rail ends with soldered brass wire or just leave them floating. 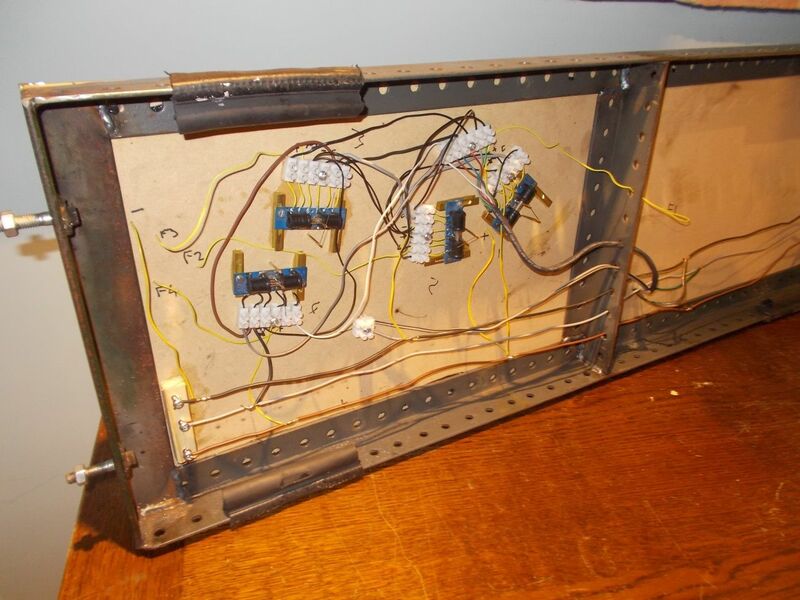 Either way, wiring is going to be very straightforward. I'm probably now up to the recommended daily limit for Evostik exposure, so I think I'll leave the rest for another day. But it shouldn't be too long before I hear the patter of tiny wheels on tiny rails again. Excellent progress, Richard. Thanks for the update. I agree that a steeper sloping rough would be more suitable for the local climate with plenty of rain and snow. Maybe remove the lower roof and replace it with a much smaller V-shaped roof over the door? Adding drainpipes, mortar and weathering would transform it into a very nice little building I think. I was worried that my first point operating mechanism might have been a fluke so I have done two more. They work just as well as the first one. It wouldn't take much now to get something running, but it's past my bedtime. Well-done, Richard. That's very good progress. Way beyond my capabilities. I look forward to seeing something running in due course. 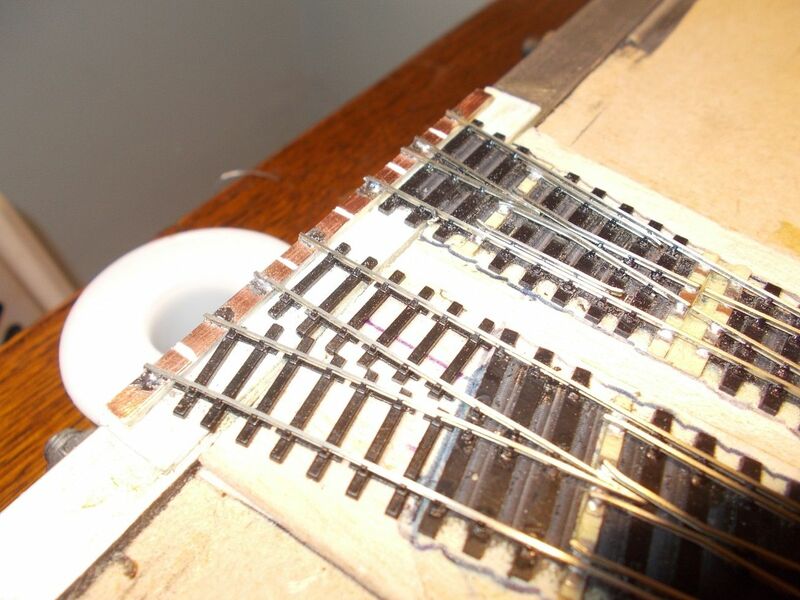 As usual I will be running copper busbars the full length of the layout to keep the wiring nice and simple. I found some lengths of twin plus earth cable on a rubbish tip. Stripped of insulation they will do nicely. I also needed a cable and plug for the point control box. I dug around and found an old computer monitor extension cable, 15 core. Not heavy duty but should cope with momentary currents. Finally in the bottom of a box of old tat was an unused 9 pin DIN plug and socket which will be just the job for the join between the two boards. The same box yielded a nice little 2 amp 16 volt AC power supply. 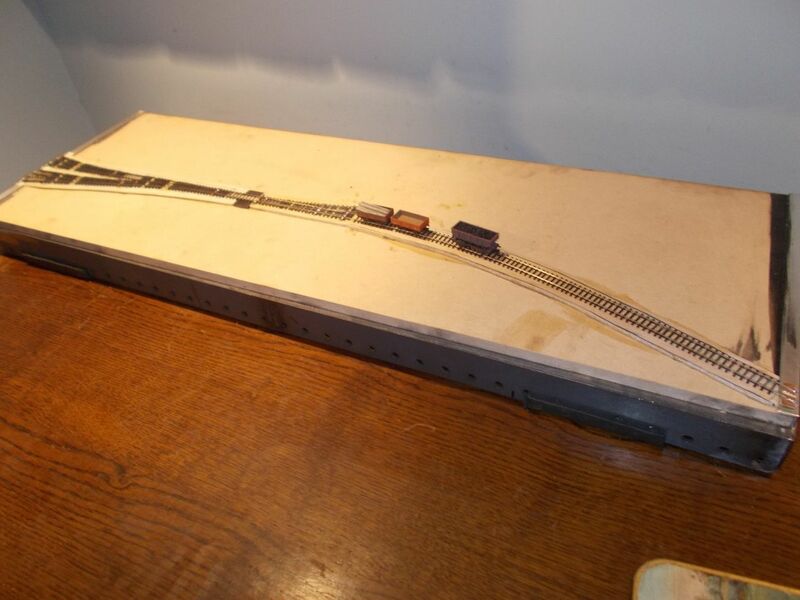 Plan is to finish the tracklaying and get it all wired up this weekend. Looking forward to the next photo. update. I think there was earlier reference in this thread to Ian Futers plans of stations on the Border Counties and Wansbeck lines and to the Disused Stations web site - both great sources. For somewhere like Longframlington, perhaps the style of Brinkburn or Longwitton (both pictured on the Disused Stations site) would be suitable - the latter has a grounded coach body for added atmosphere. A Union Mills J27 or J25 would fit in nicely too. Colour Rail has pictures of 65687 at Rothbury in the 1950s. Thanks for that. I picture Longframlington as having a slightly more substantial station than Longwitton or Brinkburn, both of which served a population of about ten people. (No wonder the Rothbury branch closed to passengers in 1952, how it lasted that long is a puzzle.) Another good source for anyone intrigued by these quiet little North Northumberland branches is "Morpeth to Bellingham" (Middleton Press, 2016). There is a book out there waiting to be written - "Britain's Most Hopeless Railways". The Rothbury branch will surely be in there along with the Cambridge - Mildenhall line. 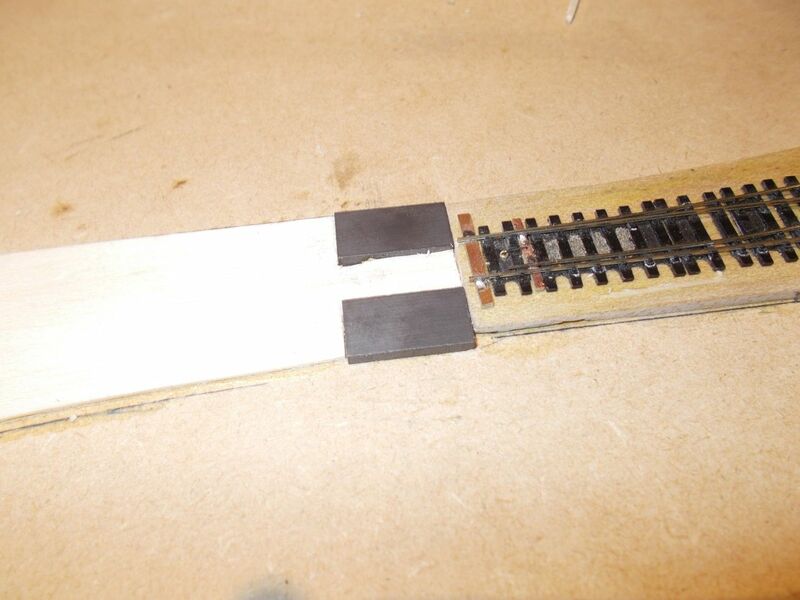 I tried that "simple" copper busbar when I started Claywell and very quickly came to regret it as one of the wires of one of my accessory decoders became detached and touch the exposed copper bus with the result of a dead board. I now use insulated wire for my bus as it was a costly error. Accessory decoder? Wozzat? Seriously, it's a good point, especially as leaving the insulation on my scrounged cable is easier than taking it off. It's not as if I will have that many wire droppers to solder up anyway. Dead short on the cattle dock road, cause unknown at the moment. Sticky point operating mechanism, again on the cattle dock road (but that isn't the cause of the short). Check rail on the goods siding entrance is slightly tight and needs tweaking. Two point motor switches wired the wrong way round. No idea why I got that wrong, I checked the wiring twice before connecting everything up. But easily fixed. Overall, not bad I think. I scrapped the idea of a separate point control box and stuck the switches on a plinth in the fiddle yard - mainly due to laziness. I need a proper DIN plug and socket for the controller, and the wiring still needs routing and fixing down as you can see. As usual I have done the whole thing using scraps of wire salvaged from various sources with no attempt at colour coding - another advantage of micro layouts, you can get away with that kind of thing. Tomorrow morning I will go out and find some Timebond adjustable contact adhesive, as the Finetrax flexi track needs a bit of fettling once it is in position, and ordinary contact adhesive tends to grab instantly. 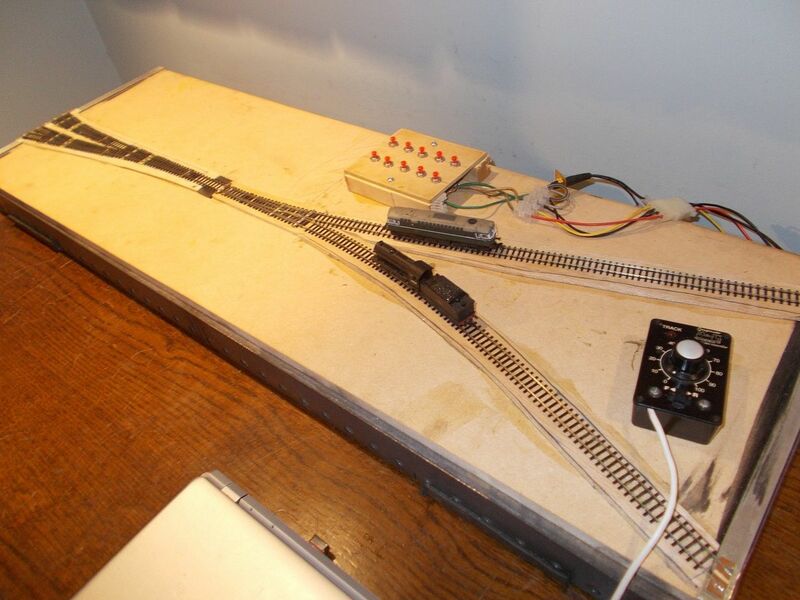 Then I can lay the track on the second board, wire it up and hopefully have a complete running layout by teatime. Hope you resolve your probs very soon.